Rosetta spacecraft used its Philae lander's CIVA camera to take a photo of the side of the lander and one of Rosetta's own solar wings. Comet 67P/C-G floats in the background. Image released Sept. 10, 2014. 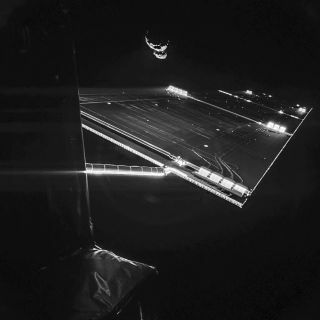 It's official: A European spacecraft has snapped a robotic selfie with a comet in deep space. The Philae lander riding with European Space Agency's comet-chasing Rosetta spacecraft snapped a stunning photo of the spacecraft and its target comet, 67P/Churyumov–Gerasimenko. The image — released by ESA on Wednesday (Sept. 10) — gives viewers a new perspective on the spacecraft and comet flying far from Earth. "Two images with different exposure times were combined to bring out the faint details in this very high contrast situation," ESA officials wrote in a blog describing the photograph. "The image was taken as part of the preparations being made for Philae, as the lander team gear up for the first ever attempt to land on a comet." The Philae lander is expected to touch down on the comet's surface in November, and until then, it is flying with Rosetta near Comet 67P/C-G. ESA officials are planning to announce the probe's primary landing site in an event on Sept. 15. Philae's CIVA instrument (short for Comet Infrared and Visible Analyzer) captured the image. CIVA is one of 10 instruments flying aboard Philae, according to ESA. Rosetta is carrying 11 scientific instruments (not including Philae's experiments). Scientists hope that Rosetta and Philae will be able to help them learn more about the mechanics of comets — bits of rock and dust leftover from the beginning of the solar system. Rosetta launched on its decade-long journey to the comet in 2004. It arrived at the comet in August, and since then, the probe has been beaming back amazing images of its target. Comet 67P/C-G takes 6.5 Earth years to orbit the sun. Rosetta will fly with the comet on its way toward its closest approach to the star, allowing the probe the unprecedented ability to see how the comet changes as it warms up while flying closer to the sun. The mission's name comes from the Rosetta Stone — a famous block of rock found with text inscribed in three languages on its face. Philae is named for an obelisk found on an island in the Nile River. The two artifacts helped researchers translate Egyptian hieroglyphics.